iPhone season, the time of year when you're suddenly torn between your perfectly good phone and Apple's shiny new versions like the Distracted Boyfriend meme, is once again upon us. 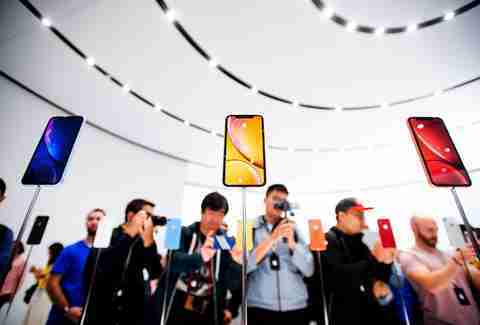 On Wednesday, Apple officially unveiled its lineup of new iPhones -- the iPhone Xs, iPhone Xs Max, and iPhone XR -- during its much-anticipated "Gather round" event at its Cupertino, California, headquarters. Between all of the new screen sizes and color options, there's a lot to unpack. Here's everything you need to know. These two phones are the direct successors to the iPhone X. They're the top-of-the-line models this year with improved specs like OLED screens, dual cameras, and better waterproofing. They have price tags to match: The iPhone Xs starts at $999 and the iPhone Xs Max starts at $1,099. The biggest news here, though, is that Apple has built its biggest iPhone display ever on the Xs Max. It's a whopping 6.5 inches from corner to corner. Both come out on September 21, with pre-order available September 14. Apple took much of the best tech and features -- Face ID, advanced cameras, super-fast chips, and more -- of the iPhone Xs and found a way to package them at a lower price point with the iPhone XR. The new, 6.1-inch phone comes in a handful of fresh color options and starts at $749. You'll just have to wait a little longer to get one, though, because they're not set to hit stores until October. When Apple's SVP of Worldwide Marketing Phil Schiller first introduced the iPhone Xs Max on stage during the product unveiling event, he confirmed the giant new phone boasts the biggest display the company has ever built into an iPhone. In fact, the Xs Max sports a 6.5-inch display that's roughly 18% larger than last year's iPhone 8 Plus (5.5 inches) while having a slightly smaller body/form factor. That's a whole lot of screen. 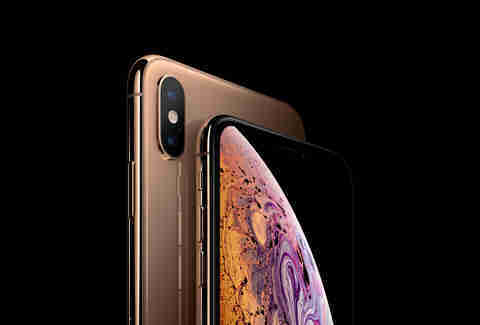 Like the smaller iPhone Xs, the iPhone Xs Max's screen is packed with technology, which Apple has branded as the Super Retina Display. Key features include support for Dolby Vision and HDR 10, the best color accuracy on the market, and a million-to-one contrast ratio for intense brightness for colors and deep, dark blacks, according to Apple. 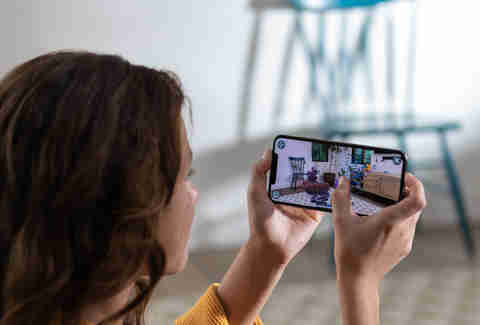 "iPhone Xs Max delivers a more immersive experience with over 3 million pixels for videos, movies and games, offering the largest display ever in an iPhone in a footprint similar to iPhone 8 Plus," the company said. Big news for the accident-prone among us: The iPhone Xs and iPhone Xs Max are able to withstand being submerged in even deeper water without being destroyed than older iPhones. Specifically, Apple has built the new handsets with a splash and water resistance of IP68, which means they can be submerged in up to two meters (about 6.5 feet) for up to 30 minutes. Apple said they're also protected against "everyday spills including coffee, tea, and soda." The iPhone X was only waterproof in up to one meter (about 3.25 feet) of water. At this point, Apple would face angry mobs if it didn't increase the battery life in its latest iPhones. Thankfully, it delivered with improvements that you'll likely notice in your day-to-day usage. Apple claims the iPhone Xs Max, which sports the biggest battery ever stuffed into an iPhone, will last for an hour and a half longer than the iPhone X. Meanwhile, the iPhone Xs will deliver a modest half hour of additional battery life compared to the iPhone X. It's better than nothing, right? Face ID, the advanced camera system that automatically scans your face and unlocks your phone, is already pretty fast on the iPhone X. But for the iPhone Xs and iPhone Xs Max, Apple made it work even faster. The company claims that things like unlocking your phone, logging into Face ID-enabled apps, and impulse shopping via Apple Pay will feel even quicker. Great. Apple said its new chip, the A12 Bionic, is the most powerful processor in a smartphone and packs the first 7-nanometer chip ever in a smartphone. Translation: The damn thing is blazing fast. It's also more power efficient than previous phones. What does this mean for using your phone? Better gaming, video editing, photography, and smoother experiences using graphics-intensive apps. This is also the key to the battery life improvements we mentioned above. You can also thank the performance stability improvements and enhancements that come with iOS 12. 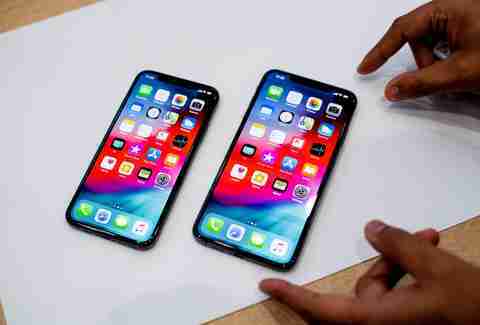 Just as the rumor mill had predicted months ago, Apple introduced a new, 6.1-inch iPhone X-style iPhone at a lower price point that's aimed at bringing the latest iPhone features to "even more people," according to the company. Of course, this means it doesn't come with quite as many bells and whistles as the top-of-the-line iPhone Xs. Perhaps most notably, it features a new LCD "Liquid Retina Display" that's likely not as bright and accurate as the OLED displays of the more expensive models. Another notable difference: a single 12MP camera, versus the Xs's dual-camera setup. With that said, the iPhone XR starts at $749 for 64GB of storage, while the iPhone Xs starts at $999 for 64GB of storage. With the exception of the wildly colorful iPhone 5c back in 2013, most iPhones in recent years have been limited to colors like black, white, gold, and sometimes red. In fact, the Xs and Xs Max only come in silver, space gray, and gold. The iPhone XR, however, comes in six different finishes with matching anodized aluminum frames: black, white, red, yellow, coral, and blue. The home button and fingerprint sensor is officially dead, at least across Apple's 2018 iPhone lineup. Instead, all three phones, including the iPhone XR, feature the same advanced Face ID technology that's powered by the TrueDepth Camera system located in the "notch" at the top of the phone's screen. Apple said it's the "most secure facial authentication system ever in a smartphone." Here's how the company explains it: "The TrueDepth camera system uses precision depth-sensing technology that goes far beyond the capabilities and security of two-dimensional facial scanners to unlock iPhone, use Apple Pay, gain access to secure apps, and many more features with just a simple glance." This also means that instead of clicking the home button to wake up the screen on your iPhone, all you'll have to do now is touch anywhere on the screen to make it come alive. Both of these phones sport the same dual-camera setup, and it's a beast: a 12MP wide-angle camera and a 12MP telephoto camera. The side-by-side cameras are responsible for things like dual optical image stabilization and 2x optical zoom, just like the iPhone X. A new sensor built into the cameras, however, is twice as fast for even better camera performance. Perhaps the biggest camera improvement is what Apple calls Smart HDR. Most smartphone cameras have some sort of HDR (high dynamic range) capabilities, but engineers at the company have super-charged it in the new phones with technologies -- an enhanced ISP and advanced algorithms, among others -- to bring more highlight and shadow details to your photos. This, combined with the faster sensors and zero shutter lag, also make for sharper action shots that might otherwise turn out blurry. Your portraits -- including selfies -- are about to look even more stunning, too. The improved cameras result in portraits with more sophisticated background blur, or as the pros call it, bokeh. You can even control how blurry or sharp the background is with an all-new Depth Control slider that appears as a new editing tool in the Photos app. You can do the same with selfies you shoot in Portrait Mode, meaning you may someday be able to take significantly fewer selfies before feeling satisfied enough to post one for the world to see. The iPhone XR is equipped with just one 12MP camera, but it can pull off some of the same effects as the iPhone Xs, including the aforementioned Smart HDR and Depth Control capabilities. It also has the exact same 7MP TrueDepth front-facing camera as the more expensive models. However, the single-camera setup lacks the dual optical image stabilization and optical zoom that makes for slightly more impressive photos on the Xs. But judging from examples of images taken with the iPhone XR, you may not be able to tell much of a difference in most cases. As for video, all three new iPhones can record 4K footage at 24 fps, 30 fps, or 60 fps. Beware, though: The higher quality video eats up your phone's storage faster. Both the iPhone Xs and the iPhone Xs Max will be available for pre-order through Apple, starting on Friday, September 14. They'll officially launch in stores the follow Friday, September 21. If you don't manage to pre-order one, prepare to wait in a loooong line this fall. As for pricing, the iPhone Xs follows a similar structure as last year's iPhone X, with the exception of a pricier 512GB storage option: 64GB for $999, 256GB for $1,149, and 512GB for $1,349. The bigger iPhone Xs Max also comes with a bigger price tag: 64GB for $1,099, 256GB for $1,249, and 512GB for $1,449. You'll have to wait a little longer to get your hands on the slightly low-cost iPhone XR. The colorful phones won't hit stores until Friday, October 26. Apple will start taking pre-orders for them on Friday, October 19.